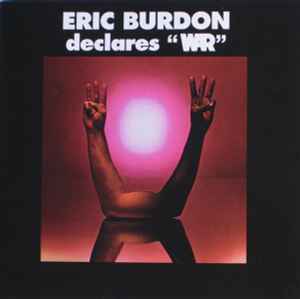 Eric Burdon Declares "War"* ‎– Eric Burdon Declares "War"
Record Company – Audio Video Entertainment, Inc. Published By – TMC Music Inc.
All Compositions Written by War (Allen/Brown/Dickerson/Jordan/Miller/Oskar/Scott) & Published by TMC Music Inc./Far Out Music Inc. ASCAP, except: "Tobacco Road" Written by John D. Loudermilk & Published By Cedarwood Publishing BMI; and "Mother Earth" Written by Peter Chatman & Published by Arc Music Corp. BMI. Produced by: JERRY GOLDSTEIN for AVENUE RECORDS/Far Out Productions, Inc. This album was originally issued as MGM #4663, 4/70. ℗ 1970 & 1992 Avenue Records/Far Out Productions, Inc., a Division of Audio Video Entertainment, Inc.